Leitchfield, Kentucky native Carl Neal Kelly, enrolled at the University of Kentucky after graduating from Leitchfield High School. During college, he was a member of Tau Beta Pi; engineering honor society, Eta Kappa Nu, electrical engineering honor society; and the Institute of Radio Engineers. He received a Bachelor of Science degree in Electrical Engineering from the University of Kentucky in 1961. He would later earn a Master of Science degree in Electrical Engineering from the University of New Mexico and a Ph.D. degree in Information and Control Sciences from Southern Methodist University. Dr. Kelly’s career spanned more than 40 years during some of the most exciting times for the information technology sector. He began his career in the Washington, D.C. area with positions at Computer Sciences Corporation and C3. He later held engineering positions with E-Systems, Ford Western Development Laboratories, Thiokol Chemical Corporation and Sandia National Laboratories. At Sandia National Laboratories, he was charged with designing and deploying digital computers in a variety of defense and space applications, including the Apollo program and NASA deep space scientific probes. Also at Sandia, he was a member of Joint Task Force 8 during the last atmospheric nuclear test series. 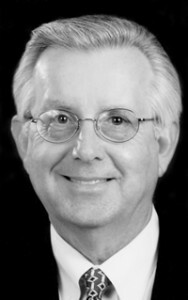 He has served as vice president and division general manager of Litton/PRC’s Systems Integration Division, where his division won more than $2 billion in contracts and as vice president and a member of the board of directors at Scope, Inc.
Dr. Kelly joined the Oracle Corporation, Reston, Virginia in 1994. Oracle is the world’s second largest software company and the largest supplier of software for information management with annual revenues exceeding $4.2 billion. The company offered database, tools and application products, along with consulting, education, and support services in over 90 countries. As president of Oracle Complex Systems, he was responsible for services and systems integration for the federal sector. Under his leadership, the company grew by 600 percent and became the basis for the creation of Oracle Service Industries. Later, Dr. Kelly served as senior vice president and general manager of the higher education vertical, where he was responsible for delivery of Oracle’s lines of business into the higher education market, consisting of more than 3,000 educational institutions within the United States. Dr. Kelly was then named senior vice president for OnLine Services for Oracle Service Industries (OSI). As such, he was responsible for the strategy and delivery of Oracle’s application service provider solutions in the service industries. This included the creation of a select group of network affiliates with hosted solutions for each of the markets in OSI-government, higher education, healthcare, communications, utilities and financial services. Dr. Kelly retired in January 2002. Dr. Kelly compiled a distinguished record of public service at the federal and state level. He was the 2001-2002 chairman of the State Council for Higher Education for Virginia, the state’s coordinating body for higher education, and its Executive Committee. He also serveed on the Council’s Resources Committee and Planning Committee, and was an ex-officio member of the Academic Affairs and Outreach Committees. He was a member of the Virginia Governor’s Information Technology Commission, consisting of leaders in the areas of telecommunications, Internet communications, finance, research and development, systems integration, and manufacturing, and chaired that panel’s recommendations on workforce issues. He was also a member of the Governor’s Task Force on Digital Opportunities and was a member of the board of directors of the Northern Virginia Technology Council. Dr. Kelly chaired a blue-ribbon delegation of Virginia’s corporate and educational leaders to create closer ties between Virginia companies and universities. Dr. Kelly was recognized for his contribution to the federal community by being named to Federal Computer Week’s Federal 100. He published numerous papers on information processing and his research work in the area of signal processing and applied materials resulted in several United States patent applications. Dr. Kelly died October 7, 2006. He is survived by his wife, the former Jody Turner, and their children.